Sanna is so right in this comment. The less little stuff you have the smaller and or fewer the furniture needs to be to fit it in. Sanna is sending us some great comments this week. I like her strategy for not indulging on an whim in this comment she left on Saturday. Elspeth runs us through her thought process as she was decluttering clothes last week in this comment. 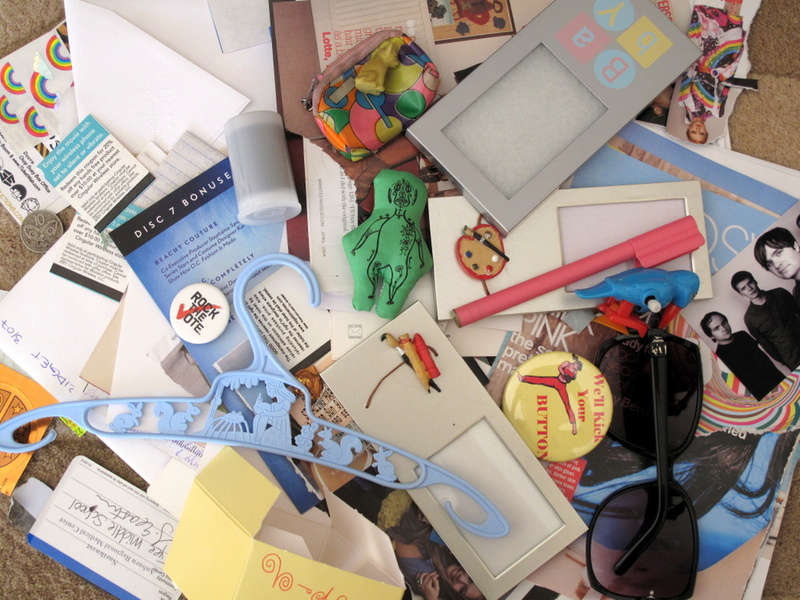 Decluttering is more than just getting rid of stuff it is about adopting smarter thought processes when it comes to stuff. Read this comment from Chelle and then could you all reassure her that she is more than good enough. Melissa has got it right in this comment. This short post from A Guy Named Dave talks about the importance of stuff. And he is right stuff is important it only becomes a problem when we can’t get enough of it. My daughter is still cooperating with decluttering her stuff. Everyday this week she has gone through at least one box of stuff. Some boxes are big some are shoe box size but every box counts. My son because he makes me laugh. He found my computer sitting on this spot and added himself to this space. I had to edit what he wrote of course because he is very naughty. Colleen, these are some great comments & sites. I especially like what Elspeth had to say. For some reason it really resonated with me & I am finding myself even more motivated to go through more things to see what else I can declutter. I don’t plan to move into a tiny house like the one pictured in Rowdy Kittens but I do hope to eventually move into a studio apartment where I can have just what I need. Chelle, just a quick note to say I know what you mean about “am I not good enough to use the good things.” I used to feel that way. Then one day I was talking with a friend who had a lot less than I did but was having such a great time entertaining friends. She said that she finally realized that it wasn’t what she had that made good entertainment but who she was & what she did. That conversation is what started me on the road to decluttering. We are still ‘House Hunting’ but when we move I don’t want to be taking 2 Benno (IKEA) shelf units with me. These 2 units house all of our music and movies + all our Dance Discs. Just would really appreciate any feedback and suggestions, apart from chucking the lot hahaha. Personally, I don’t have a lot of DVDs, but my daughter could probably run her own movie theatre! She downloads her DVDs into a hard-drive (her photos and music also) and carries that around together with her laptop. It seems to work for her; perhaps it would for you? this is how we store our CD collection. Just scroll down to the bottom of that link and you will see the boxes with sleeves which are designed for this purpose. My suggestion with the music is to digitise it like we have then you never really need to touch the CDs themselves. Everything is on iTunes and our iPods are completely transportable. If you have a portable iPod dock you can play your music out load at dance. Or you could check to see if there is a connection point on the existing equipment to plug the iPod into. This storage method also works for DVDs. I would just file them in alphabetical order of movie title with series like Harry Potter altogether under H for Harry. As you can see from the photo we store all the cover sheets in a separate box just in case we want to sell any of it off later on. And I know I can pick up cases at the thrift store anytime should we have the need for them. give a deep thought to going digital and decide whether you can do it. I decided I could for earbooks because I did not have sentimental attachment to the physical product. I could not for music partly for attachment partly for the shear load of material. I would love to go digital with the music some time in the future but I know I would keep some cds too for the tangibility. I decided not to keep movies at all at the moment but want to go digital in that field some time in the future for the favourites that I keep wanting to watch again( I don’t own those nowadays anyway the ones I decluttered weren’t keepers in the strict sense). But, sorry for wandering off: Aluminum CD Cases, for example by Hama, can store amazing amounts. They work like hanging files only with cd sleeves. If you prefer binders (I don’t know if you can find it in Australia but maybe there are similar systems): case logic makes huge ones for up to over 300 discs. Another solution may be to just get simple sleeves (plastic or paper is fine enough) and store them in nice unobtrusive lidded (! no dust!!) boxes that fit one row (like kassett or kvarnvik from ikea). For protection: keep a couple of empty jewel cases around to transport cds. If you use the slim jewel cases put the cd in backwards, with the silver side facing in so it cannot rub against the jewel case. Touching, rubbing, lying around without a case, pulling them over something scratchy, dirt, dust: That’s what scratches CDs. Storing them without their original hardcases can be perfectly fine though! Good luck with that task!! I’m quite similar, although I have a few DVDs of my favorites for those times when I need a pick me up (think Love Actually, P&P etc.). one of my few DVDs is Love Actually it is such a great chick flick. I think you are right Snosie, learning when you are young before falling into the same “gotta have it” habits of the previous generation. Yes they can be cheap to buy but do you really want them hanging around the house. One thing I know is that the bulk of the ones in our house either belong to the kids or my husband very few are mine. I doubt I would be happy in a house the size of a small caravan either but I know I will be happy in a house smaller than the one I am in now. One thing I appreciate is that it seems the smaller the space the smarter the floor plan so the space is utilised well. A smaller home can then feel as spacious as a bigger one. congrats to you and your daughter! I can so relate to those boxes (I have been “downsizing” those over the last seven months) and I really hope she can appreciate the decluttering outcome as much as you. I think she can appreciate the decluttering as much as me because she knows her stuff will be hot on her heals when she finally moves into a place of her own and she would then have to deal with it. I must ask her if that has been on her mind as we do this together. It didn’t occur to me to take a photos of the space her stuff was in before we started to declutter. I will put all the empty boxes back and take a photo now so I can post about it and you can all see the difference she has made.